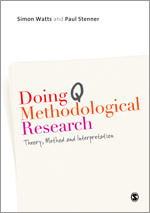 Q-methodology (also known as Q-sort) is the systematic study of participant viewpoints. Q-methodology is used to investigate the perspectives of participants who represent different stances on an issue, by having participants rank and sort a series of statements. Q-sort is a mixed methodology. It uses the qualitative judgements of the researcher in defining the problem, developing statements to investigate the perspectives of participants (some of the statements may be developed after interviewing key informants), and selecting participants. It uses quantitative options of analysis. It can be very helpful in unearthing perspectives without requiring participants to articulate these clearly themselves. It is a useful complement to a range of other objective evaluation measures. For example, Q-methodology can be used to examine teacher’s perspectives on teaching as part of an evaluation of a school district. Other evaluation measures can include test scores, attendance and completion. Operant Subjectivity: This journal from the International Society for the Scientific Study of Subjectivity aims to provide the latest research and opinion on Q Methodology in order to foster a greater understanding of subjectivity. 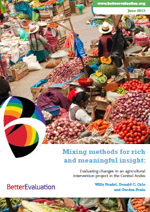 Q methodology: A sneak preview: This paper, authored by Job van Exel and Gjalt de Graaf aims to provide a detailed overview of the basics of Q methodology for those who need easily accessible information on this research strategy.